Like Hidan there are two types of Kakuzu as well. In this article, we will take a look at Kakuzu [Earth Grudge Fear]. Kakuzu is the shinobi from the Village by Waterfall. He joined Akatsuki and was partnered with Hidan. He is also one of the ninja who fought the First Hokage though he failed against him. He was killed by Naruto initially but was reincarnated during the Fourth Shinobi World War. Let’s take a look at Kakuzu [Earth Grudge Fear]. Ninjutsu Fire Style Wind Style – Inferno Raging Weaves: Attacks up to 2 units from the opponent’s Lineup with Fire and Wind attribute damage and is very likely to cause Repulse. Ninjutsu Earth Grudge – Final Shot: Triggered with at least 20 COMBO, causes Fire, Wind and Lightning attribute damage to 3 random units of the opponent’s team. Ninjutsu Earth Grudge – Limb Reattachment : Before the first action in a round, recovers some Life points to 2 random Akatsuki units from your field and will cancel all Debuffs on these Akatsuki units. Ninjutsu Super Armor: Immune to Low Float, High Float, Repulse and Knockdown. 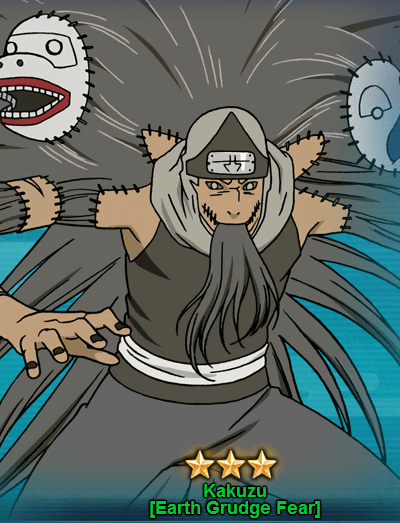 Kakuzu [Earth Grudge Fear] might be available in other events too in future. Taking the initiative to help newbies to have enjoyable Naruto Online game.